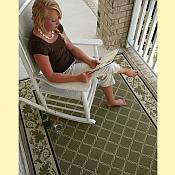 The DuraCord® All Weather Indoor/Outdoor Rugs by The Hammock Source are a great accent to any patio, pool area, porch, or sunroom. Styles of contemporary, or traditional, that coordinate with the latest patio furniture and styles. 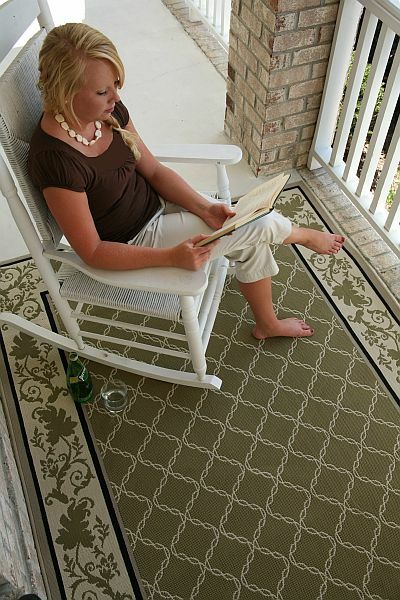 These outdoor rugs are constructed of a Thermal bond construction that provides a unique wet/dry performance. DuraCord® fiber is tough enough to withstand the outdoor elements but soft enough to have the plush feel of soft cotton. The color dye is synthetically mixed into each fiber before manufacturing so they are fade resistant. Colorfast - Long exposre to sun will not fade the vibrant colors in this fabric. The fibers were colored while still in solution form. Fast Drying - With 0.05 percent moisture regain, this fabric does not absorb water and therefore dries very fast. Stain Resistant - DuraCord® resists staining due to its nonabsorbent properties. Abrasion Resistant - Other synthetic yarns do not stand up to any abrasion and are not suited for the wear and tear of outdoor living. DuraCord® lasts under rough use. Bleach Resistant - Bleach can be used for cleaning this fabric as it does not affect the fabric's color. Mildew Resistant - DuraCord® is produced with built-in anti-microbial blockers. High Strength - This is a truly lightweight fabric with heavy-duty strength. Environmentally Friendly - DuraCord® offers an environmentally friendly alternative to other synthetic fibers as it requires less energy and water to manufacture.